IRRCi Investor Research papers accepted in fifth annual competition. Two winners will receive $10,000 each and will have an opportunity to present their research findings at the 2016 Columbia University Millstein Center for Global Markets and Corporate Governance Forum. Practitioner and Academic submissions will be accepted until October 7, 2016. The Investor Responsibility Research Center Institute (IRRCi) opened its fifth annual competition for research that examines the interaction between the real economy and investment theory. Practitioners and academics are invited to submit research papers by October 7, 2016, for consideration by a blue-ribbon panel of judges with deep finance and investment experience. 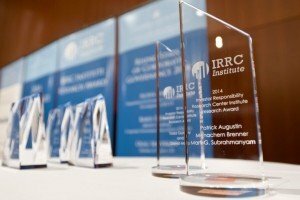 Two research papers – one academic and one practitioner – each will receive the 2016 IRRCi Research Award along with a $10,000 award. The winning papers will also be presented at the December 7, 2016, forum of the Millstein Center for Global Markets and Corporate Ownership at Columbia University in New York City. “In its fifth year, the IRRCi research competition continues to be a prominent award for academic and business leaders who offer original thinking on complex investment issues,” said Jon Lukomnik, IRRCi executive director. For example, last year’s two winning papers were selected because they offer fresh ideas on two key issues confronting investors – climate change and the fund flow to index funds. The two research tested conventional wisdom and, as a result, investors are re-thinking their strategies. Award submissions are accepted online here. Submissions may be an original work created specifically for the IRRCi Research Award, or relevant unpublished papers, or papers that have been published after July 1, 2015. Winning papers will be presented at the Columbia University Millstein Center’s conference, published by the IRRCi on its website, and distributed to some 6,000 individuals interested in the organization’s research. As noted on the IRRCi web site, Modern Portfolio Theory (MPT) has dominated investment theory for a half century. MPT focuses on security selection, portfolio construction, and other financial issues rather than the intersection of the real economy and investing. Simultaneously, the growing importance of the private sector relative to the public sector in the real economy has increased scrutiny of private sector behavior and economic activity. The IRRCi Research Award encourages new research that analyzes how investments interact with real world economic activity. More information regarding the award process, submission guidelines and calendar is available here, along with the award submission form, list of past recipients, and Frequently Asked Questions.